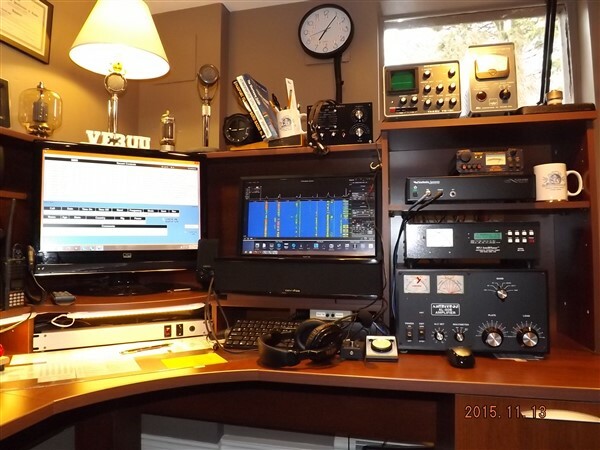 Welcome to amateur radio station VE3UU, located in the country, 6 KM outside of Carp Ontario, a suburb of Ottawa, Canada’s capital. Until it got amalgamated into Ottawa, Carp was a sleepy little village of 900 people that was famous for a 100,000 square foot, four-story building that you couldn’t see! It is an underground nuclear bunker, called the Diefenbunker, that would have held the Canadian government in case of nuclear war. 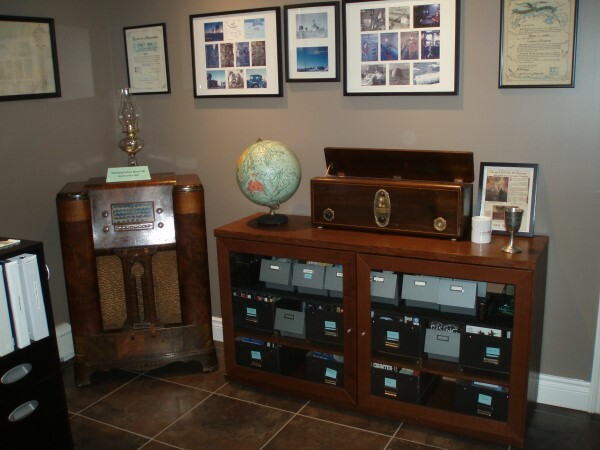 It has been repurposed as Canada’s Cold War Museum. In 2015 I became fascinated with software defined radio (SDR) after playing with a SDR dongle. I sold my treasured TS-2000 and acquired a FlexRadio 6300. The unit’s 100 watts was doing yeoman service but I was having a challenge with a net I wanted to join so I gave the station a power boost with the addition of an Ameritron AL-80B linear. In keeping with the “law of unintended consequences”, the increase in power caused me to randomly turn lights off and on in the house. My XYL found this disconcerting. The solution was to move my R-8 vertical from the chimney to a location about 125 feet away from the house. I stuck it on top of a 30 foot tower. Problem solved. I took advantage of the situation to put up a 35 foot pole about 105 feet away and installed a G5RV between the tower and the pole. The MFJ-998 IntelliTuner allows me to quickly switch from one antenna to the other as band conditions warrant. 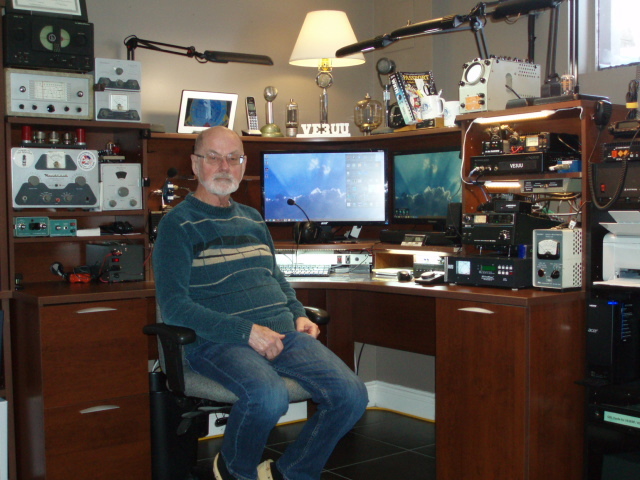 In 2017, I traded the Ameritron AL-80B for an ICOM IC-2KL solid state linear and parted company with my Yaesu FT-817 QRP rig, replacing it with an ICOM IC-718 as my stand-by station (you can never have too many radios!). 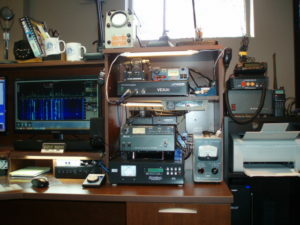 The 2018 version of a 1940 Ham operator. I’m not as grumpy as I look. Really! Main operating position showing my logging program and Flex-6300 control panel. Main equipment area showing the Flex-6300, and ICOM IC-2KL linear amplifier on top of the MFJ-998 Intellituner. 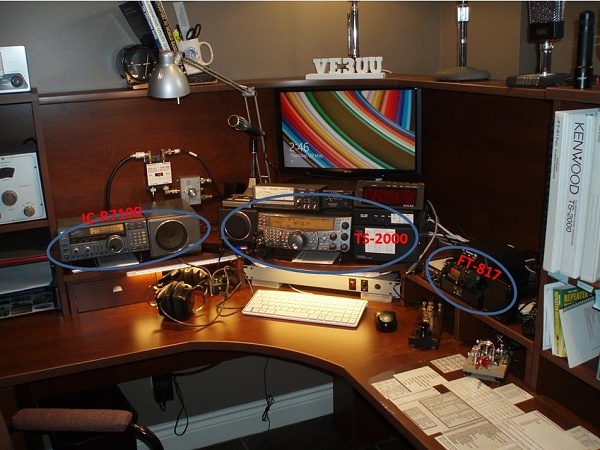 My 2-meter station is shown at the upper right. 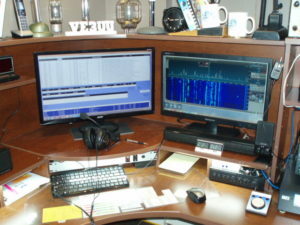 Second (stand-by) operating position, the ICOM IC-718. A boy and his toys! 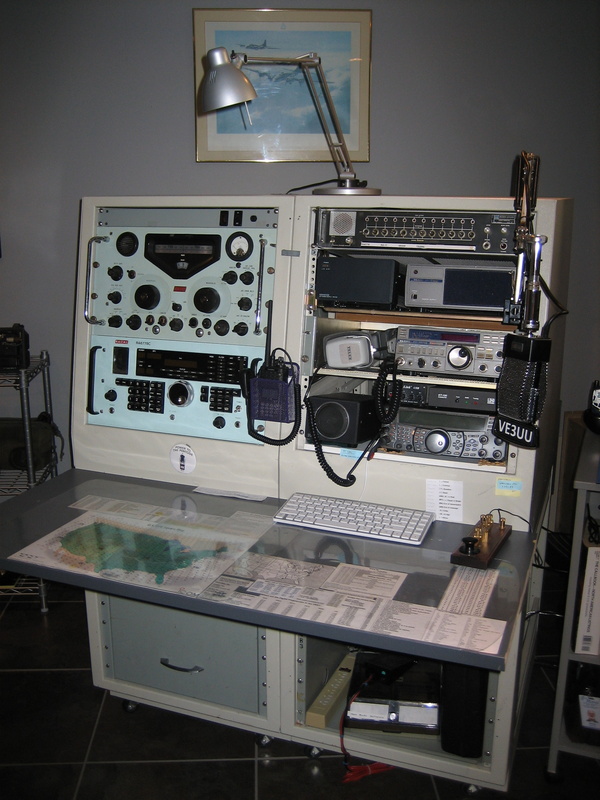 Main SSB operating position consisting of a FlexRadio 6300 and an Ameritron AL-80B linear. 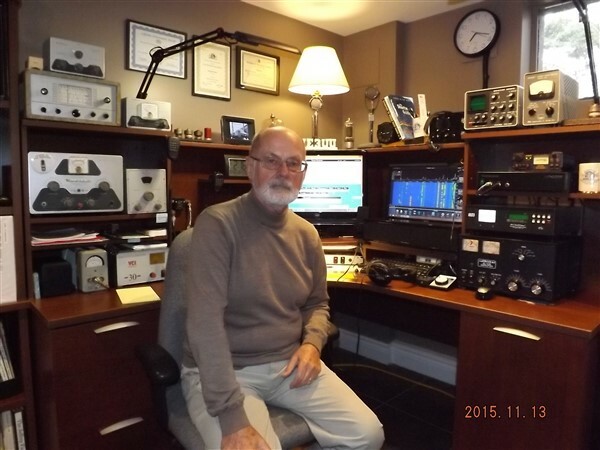 2 M and QRP operating positions. 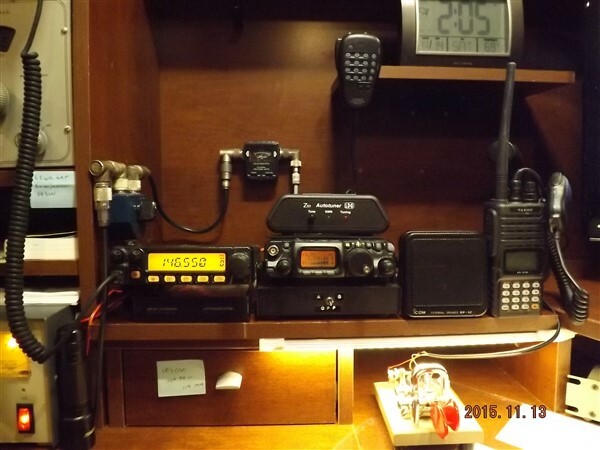 FT-1802 (2M) and a FT-817 (QRP), plus a FT-270 handheld for portable work. By 2012 or so, I had divested myself of the remaining boatanchors and was enjoying my more modern rigs. Vintage Amateur Radio operator, 1940 model. Still operating but slowing down. 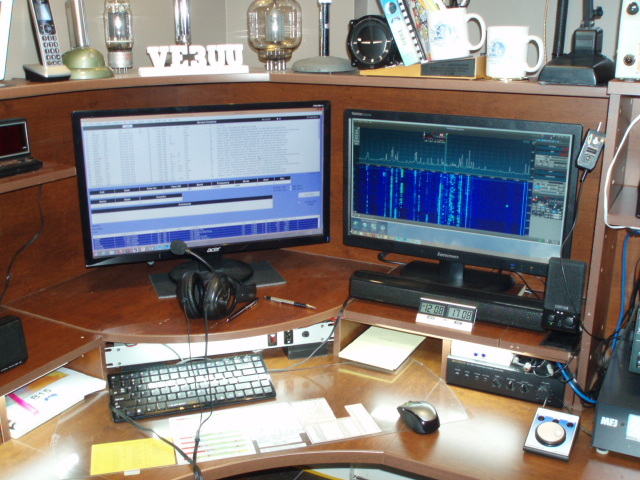 TS-2000, FT-817, & IC-R7100 radios are all conveniently located in one operating position. Nostalgia corner. 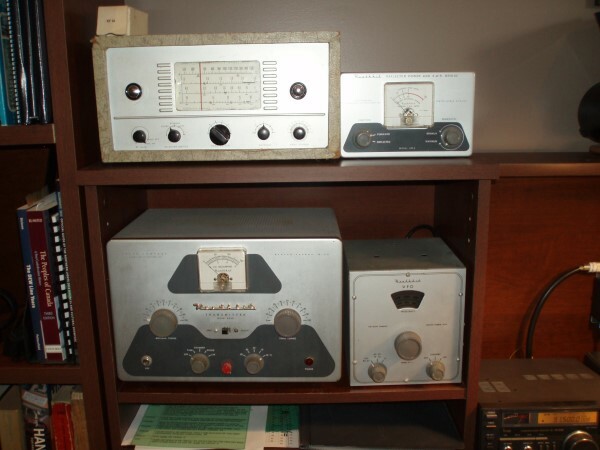 While not the original equipment, this was the type of gear that I started out with over 50 years ago. Collectors corner. The Stromberg Carlson Model 75M in the left corner was manufactured in 1940, the same year I was born. By 2010, I was beginning to thin the herd and had treated myself to a Kenwood TS-2000, probably the nicest radio I had ever owned up to that time. I held onto my two Racal radios, mostly for nostalgia reasons and SWL listening. There is something nice about the warmth of tube gear on a cold winter’s night. Starting to thin out the heavy metal. 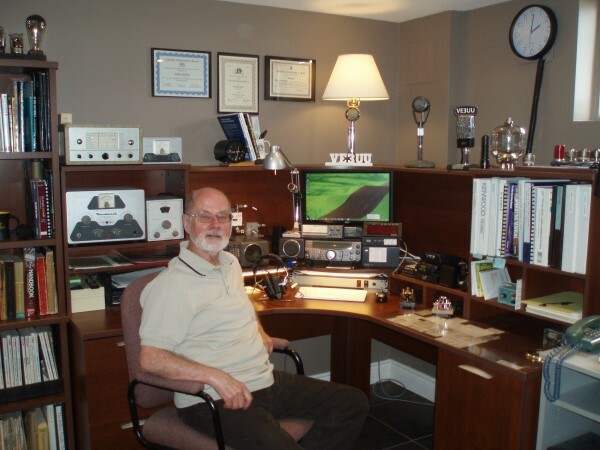 I was an avid collector of boatanchors (as you can see), particularly military radios. 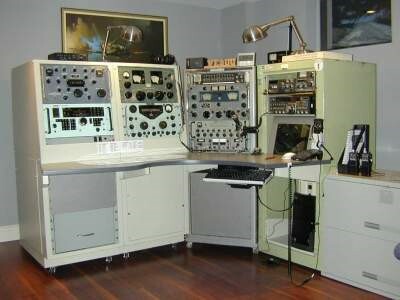 The Racal RA-17 was a nostalgic radio for me as my first job after leaving the DEWLine in 1963 was doing repair and overhaul (R&O) work on these receivers. 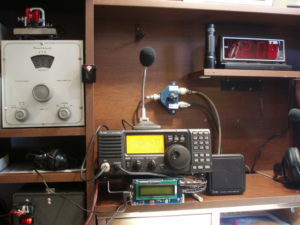 The other receivers shown in the picture below are the Collins R-390A, a Racal RA-6778C, a Hammarlund SP-600, a TMC GPR-90RX, an ACL SR-209, and a Harris RF-505A. The HF transceiver was a FT-757GX. The house was beginning to sag under all the weight (hi hi). Pre-2008 operating position. Full of boatanchors. Lots of heavy metal!